Beautiful colors!Yellow looks great on you! I really lòove your blog and outfit! Un look muy bonito! Besitos desde España! I love how the denim peeks through the yellow. Such a cute outfit hun! Beautiful yellow sweater!Love it styled with denim shirt! i love how the jean shirt shows under your yellow jumper. its genious!!! Love the boots And the fact that you always manage to look amazing even with simple clothes! I love the color of that sweater!!! You look stunning!!! many thanks to all of you !!! I love love love that sweater!! These colors are beautiful. That sweater is absolutely perfect. Le soleil de l’automne : beautiful ! Super!Yellow & blak – bittersweet colours! I really like your boots! You look great dear! Beautiful look! Love the LV bracelet! Cute outfit! I love that yellow sweater, such a cheerful color for autumn. I also like the accessories you paired with this outfit, especially the LV bracelet! This is so perfect my dear!!! Your forever inspiring,you really are. I love how you styled the soft yellow sweater over the denim dress!!! :) And those boots are a must have! What a great post. I like your sweater and your boots. Thank you for your comment on my blog and I will come back. Boa noite!! esse casaco amarelo me encanta!! ta lindona mesmo!! beijos e boa semana!! Gorgeous sweater. You look beautiful. You are so awesome when it comes to colour, I think you can rock just about any shade! lovely…you are so wonderful with the colors my dear. Fantastic your look is love it..
my dear, what a wonderful look. i said it before, but i say it again: yellow is your colour! amazing look!!!! your yellow sweater is so cool!!!! you have such a great blog i’d loved it if we followed each other!!!! Admirable style! So natural but fashionist! And brilliant colors! You have it all! yellow with denim is such a great combination! Love the sweater, it’s so stunning! Love this look! it’so beutiful! Simple and chic! Love your outfit! The sweater is a great choice for dull autumn weather! Great sweater! It’s got collar!!! Great look that combination looks amazing!! I really love this look. That sweater has a great collar and I love the color. I like the way you layered it over a chambray and tights. Lovely ensemble! Your yellow sweater is gorgeous! Thanks for dropping by! I’m adding you to my feeds. Cheers! I am starting to think I need to purchase more yellow items, this looks so pretty and I see the color popping up everywhere recently. i have to scroll like 2 years before I can post a comment, because of aal the comments. You really deserve it because your blog is so GREAT! You just made me wantt o raid my dad’s closet for his old preppy golf sweaters! Thanks for the idea…you look fab as always! love this! it feels like classic american sportswear, but slightly edgier, deconstructed. i dig it! Jajaja i been having the song in my head as well!! Love your outfit. The pics are amazing and you’re so pretty :) The yellow sweater is beautiful, love the color. Ohh I love this outfit!! Adore this kind of booties! simply perfect and confortable! You’re so cool!!! I love your blog!!! very nice. Love those boots, they’re awesome and rock your outfit! very cool that you’re making your own jewelery by the way! wow!! the yellow colour is so nice on you..love LOVE it! love all about this look! It’s comfy but glamour! You look stunning! !Love your sweater!!Kisses! You wear colours so well! Love this sweater. Jealous! You look awesome girl! 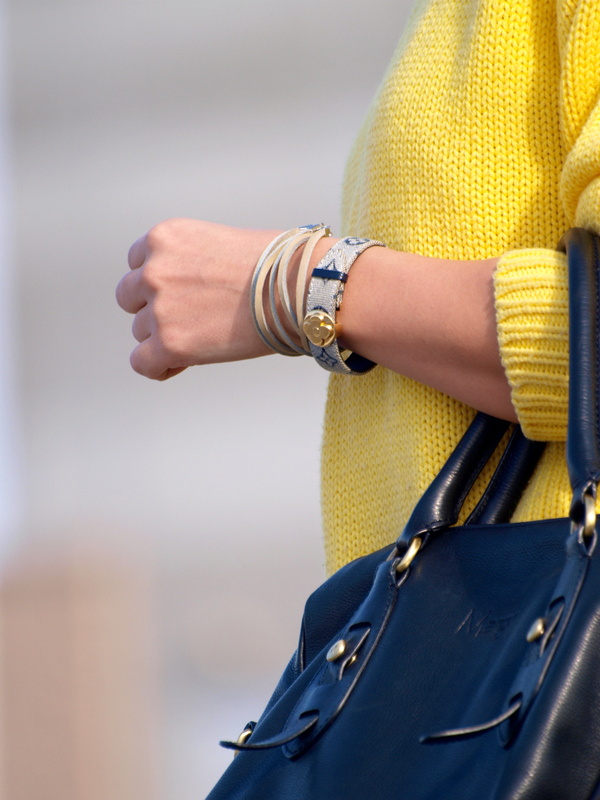 Gorgeous combination of yellow and light blue chambray! Sweetie pops, you’re like a ray of sunshine! Love the vintage sweater! Sorry i’ve been away recently, slowly catching up! I love your choice of colors, you always incorporate a bright color and it looks great! love your boots and denim shirt!you look like no other in yellow! great look Veronica! !love your sweater!! Veronica you always create absolutely amazing outfits by adding one (some) flamboyant color(s)! I love our modern take on preppy look! How pretty! You look like from the cover of the Magazine! WOW! I’m totally loving your blog! I ‘d love if you visited my blog for multiple posts on all things fashion and style. I’m following you, I hope you’ll do the same. Thanks so much. love your outfit!! your sweater is amazing and the colour more!! great blog, if you want we can follow each other! Yellow suits you!! Beautiful bag! Your style is completely fabulous! I love the sweater of yours, that yellowness is so bright and lively. Matches autumn weathers quite nicely. you look really amazing! and we lovee this yellow knit! you have new follower! you have a great blog & I love your outfit! I love your blog, you have great style and very cool!!! looks great! I love yellow!